To prepare for the Christmas season and wrap up fall semester, a number of events took place at Smith and in the surrounding area including the annual Christmas Vespers concert in John M. Greene Hall, an advent dinner in the Alumnae House, as well as La Virgen de Guadalupe Mass, followed by a dinner celebrating Las Posadas in the Helen Hills Hills Chapel. Vespers showcased the talents of many individuals and groups in the Smith community, including the Smith College Chorus, Glee Club, Chamber Singers, Handbell Choir, Orchestra, and a handful of student, staff, and faculty readers. Director of Religious & Spiritual Life and College Chaplain Matilda Cantwell led the service, providing the invocation, Christmas prayers, and benediction. Students and members of the community gathered to celebrate the Christmas season in one of the oldest ongoing Smith traditions. At the end of the service, attendees were invited to give a free-will offering to benefit the Friends of Hampshire County Homeless Individuals Winter Shelter program. Each year, Vespers contributes a significant amount to the shelter’s annual operating budget, and this year we collected a record $7,549! 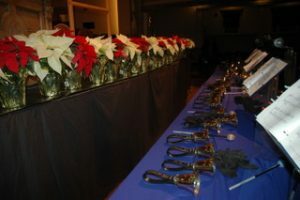 The annual advent dinner also featured the Smith College Handbell Choir, led by Handbell Director and College Organist Grant Moss. A beautiful meal was prepared by Smith catering services. Members of the Smith community and surrounding area attended the dinner to celebrate the season of advent. Cantwell led the dinner, providing opening remarks, introductions of the Handbell Choir, and even a surprise visit from Santa Claus! She also encouraged attendees to reflect on the season of advent personally. Each table shared a word or phrase that represented advent to them with the larger group such as hope and love. Finally, the Smith Christian Fellowship’s La Fe group planned a bilingual Mass celebrating La Virgen de Guadalupe, and a Las Posadas dinner following it. Father Christopher Fedoryshyn, parochial vicar from Saint Elizabeth Ann Seton Parish played an integral role in the mass and joined students in the dinner afterward. 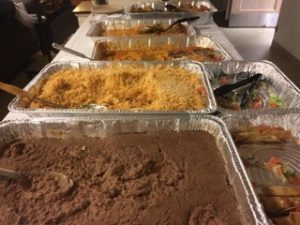 La Fe provided homemade Latin cuisine, which included tacos and burritos, guacamole and chips, and horchata. This entry was posted in Holidays, Programs & Events, Student Articles and tagged Advent, campus news, Smith Christian Fellowship, Vespers. Bookmark the permalink.